The Sixth Judicial Circuit Law Library is committed to providing cost effective and timely access to significant print and non-print useful legal resources at the local, state, and federal level to the Courts, the practicing Bar, agencies, and members of the public who search for law-related information and their pursuit of justice. The Sixth Judicial Circuit has one remaining Law Library in the courthouse in downtown Clearwater, with holdings of more than 20,000 volumes and electronic products. 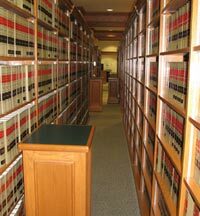 The library serves the judiciary, attorneys, self-represented (pro se) litigants, members of the legal community, county departments, and the general public. The county law libraries were created by a special act of the Florida Legislature in 1937, whereby counties having a population of 180,000 or more were appropriated funds for a law library. Law libraries were established in Pinellas County in 1950. The Law Library aims to make legal information readily accessible to the community. Librarians are not permitted to give legal advice, but they do provide patrons with guidance toward finding information. Additionally, suggested legal websites are provided as a starting point for online research. After-hours access – Members of the Florida Bar may access the Pinellas County library during non-public hours. Please sign in with the security guard and fill in your name in the guest log. Use the links below to learn about law libraries, services, and the legal resources in the collections, as well as to identify legal sites on the web that may be useful to your research. The following list contains web sites that may be useful as starting points for legal research. Included in the listing are search engines that are designed to search for legal information, comprehensive law directories that will link you to court cases, statutes and codes, law reviews and journals, attorney directories, dictionaries and encyclopedias, law libraries and associations, and forms, and, other useful links to government agencies and institutes interested in legal issues.